Although winter still has a firm icy grip on the country, spring will be here before you know it. As premature as it may sound, now is the time to begin planning your outdoor cannabis grow. In a few short weeks, the temperatures will be high enough in some regions of the country to begin planting gardens as the days continue to grow warmer and longer. This is always an exciting time of year, because growing marijuana outdoors is decidedly different from growing it indoors. Plants can grow longer and bigger outdoors. With proper space, outdoor cannabis can spread out and reach impressive proportions. There are decisions to make, including the location of the grow and exactly what will go into the garden—not to mention nutrient recipes and building a compost pile to grow truly special organic cannabis. The days of guerrilla grows are winding down for most outdoor growers. With the increasing legalization of marijuana, there is a decreasing need to create grows in remote or hidden areas. Much of the United States, as well as Canadian provinces, now allow the cultivation of cannabis if certain criteria are met. Usually, the conditions for growing outdoors include it being out of public view and in a locked, secure area. To meet these conditions, a backyard with tall fences or a large courtyard is the perfect solution. In populated areas, a secure backyard may pose some challenges, because cannabis produces strong and distinctive odors. Walls must be sufficiently tall, or you must take other measures to prevent thieves from gaining access to your garden. Unfortunately, while cannabis may now be legal in your area, thieves are alive and well, and many of them won’t hesitate to benefit from your green thumb and hard work. A courtyard is ideal. Scents may still waft into the neighborhood and alert someone that cannabis is growing in the general area, but this is not something to lose sleep over. Cannabis is growing everywhere these days, and the stigma that once surrounded it is at an all-time low. If you’re not in violation of local legislation, you have nothing to worry about. Hopefully, the dimensions of your courtyard are sufficiently large to allow the growing of the number of plants you desire. The plants should occupy the central area of the courtyard so it escapes the shadows that occur near walls. The more direct access to pure, unfiltered sunlight, the better. An outdoor grow allows you to explore a wider variety of options when it comes to which strains to grow. If your growing season is long enough, you could delve deeper into the world of sativa strains than many people choose to grow indoors. Have fun with it. With proper foresight and planning, plants started in early spring can grow to mammoth proportions by fall. Among the various cannabis strains available today, many of the popular industry favorites make excellent choices for growing outdoors. Outdoors, they are able to express themselves fully when it comes to size and yield. Letting these classic strains spread their wings and reach their full potential in an outdoor garden will give you an entirely different perspective with them. Extremely popular strains like Blueberry, Lemon Skunk, White Widow, Super Silver Haze, Trainwreck, Blue Dream, Super Lemon Haze, OG Kush, Northern Lights, Critical Mass, and Hindu Kush will all do well in an outdoor garden, and this is only the tip of the iceberg when it comes to the choices available to you. Not all strains grow well outdoors, but many do. Research what will do well in your particular climate. One of the amazing things about outdoor cultivation is that using pots is only an option and is not necessary. Under certain circumstances, using pots outdoors is wise. If you might have the need to move the plants for any reason relating to adverse weather or to avoid theft, pots are the way to go. Otherwise, a discreetly located garden will appreciate being able to grow unhindered by the root-space limitations that pots create. If you start your outdoor garden early enough, you’ll want to provide adequate space between the plants. From a size perspective, growing cannabis outdoors is nothing like growing it indoors. While the overall time until harvest can take longer, the yields can be huge—many times what the same plant will produce indoors. Growing outdoors also makes it easy to produce an outstanding organically grown crop of cannabis. Outdoor grows lend themselves perfectly to using compost, so get to work early on a compost pile. You want to prepare the soil so that you create a powerful location for your plants to take root and grow. Use a mechanical tilling machine to break up the soil and promote increased aeration. Adding other substances like wood chips, coco coir, or anything that will help promote root growth is definitely an option that can only help with early root development. Mixing in a rich amount of compost will be a final step in preparing the soil for the introduction of plants. Since it will take three months for your compost pile to produce usable compost, you will most likely have to resort to using bagged compost for the first couple of applications. Start your plants, either young clones or seedlings, in small pots that make transplanting easy. Give them a beneficial head start, growing to a height of 1½ – to 2-feet tall before moving them to the outdoor prepared soil well before the plants hit their stride during the vegetative-growth phase. Introducing organic soil nutrients and additional compost throughout the grow will make the plants explode with rapid growth once the roots develop to a sufficient size. If you’ve never created a compost pile, it’s easier than you think. Add only organic kitchen scraps and other material, and you will have rich, organic black gold in a relatively short amount of time. Cannabis plants love compost, as do most other garden plants and vegetables. The full flavor profile that organic compost promotes is a step above cannabis or produce created with other soil additives. When you start your compost pile, put it within easy access of your cannabis garden—you’ll be happy later that you did. There is a variety of ways to create a compost pile, but the basic principles remain the same. Consult one of the many composting resources online for detailed recommendations and instructions. It will take approximately three months to produce usable compost, so purchasing bags from a local nursery will accommodate your needs early in the season. By continuing to add nutritious and high-quality scraps and ingredients to your compost pile, you will have a continuous supply of nutrient-rich compost throughout the growing season. When the fall chill sets in and the days grow shorter, harvest will not be far off. Examine your plants carefully and get used to taking a small handheld photographer’s lupe or magnifying glass. Evaluate the trichomes as colder weather sets in and time your harvest carefully. Prepare to trim a large amount of flower! If you’ve always grown cannabis indoors, starting an outdoor garden will give you a valuable new perspective on growing marijuana. After your first harvest of outdoor-grown flower, most likely you’ll be hooked and want to grow an outdoor crop every year. 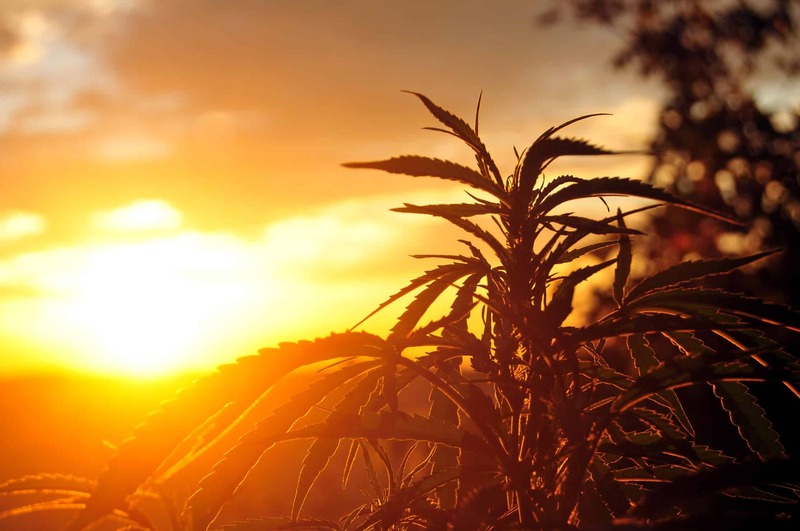 Welcome to the world of outdoor cannabis cultivation!